Following an independent review of the Yellingbo Conservation Area Coordinating Committee (YCACC), the Victorian Government is adjusting the committee structure to support the establishment of the Yellingbo Conservation Area. Given that the Yellingbo Conservation Area Draft 10 Year Plan is shifting from planning to implementation over the coming 12 months it was timely to update the governance arrangements. YCACC will be replaced with a coordinating committee of land managers and a broader-based community reference group to continue to build on the initiatives of YCACC. In July 2018 a review of the committee was initiated to comply with the mandate for Government-appointed committees to be reviewed within every three years. The review found the committee had achieved a number of successes since being formed, however, it recommended a change to governance arrangements given the Yellingbo Conservation Area (YCA) Draft 10 Year Plan is in the process of shifting from a planning to implementation phase. Read Frequently Asked Questions about the governance change. The Victorian Government has launched a $1 million Community Climate Change Adaptation (3CA) Grants program. Melbourne Water is undertaking a range of activities in the Yellingbo Conservation Area to improve biodiversity values, waterways health and to help preserve critically endangered plant and animal species including the Helmeted Honeyeater and lowland Leadbeater’s Possum. The following projects are a small representation of the extensive works being undertaken by Melbourne Water guided by the Healthy Waterways Strategy. Cockatoo Swamp Rehabilitation Project Yellingbo. Read more here. Woori Yallock Creek Improvement Works (Emerald to Macclesfield). Read more here. Little Yarra River Vegetation Management Project. Read more here. Yarra4Life is a major environmental project in the Yarra Valley that aims to protect, improve, increase and connect habitat for native animals, including the Helmeted Honeyeater and the Leadbeater’s Possum. See the latest highlights from this program here. Explore more about the work of Yarra4Life on the Port Phillip and Western Port Catchment Management Authority (PPWCMA) website. The establishment and management of the Yellingbo Conservation Area is focused on protecting our waterways from pollutants by improving riparian ecosystems and biodiversity. The importance of this work is highlighted by ongoing research into the impacts of pollutants and degraded environmental bio-systems. According to a recent study, A diverse suite of pharmaceuticals contaminates stream and riparian food webs, published in Nature Communications, pharmaceuticals from wastewater are making their way into aquatic invertebrates and spiders living in and next to Melbourne’s creeks. The YRG4W program helps Yarra Ranges residents to create an area in their garden to attract and support local wildlife. The program is run by Yarra Ranges Council in partnership with local community groups and volunteers. The Council invites you to the official launch of this partnership program, and to celebrate its success so far. The evening will include a special presentation from horticulturalist and author, AB Bishop, who will share tips on how to design, plant and maintain a fauna friendly garden, and how this can contribute to our local environment. AB is the author of a new book ‘Habitat: A practical guide to creating a wildlife-friendly Australian garden’, and co-author of ‘The Australian Native Garden: a practical guide’ with Angus Stewart. Two (2) young people with an interest in developing knowledge and networks within the environment sector. The Yarra Ranges is renowned for its natural environment. Yarra Ranges is home to valued townships, urban streetscapes, forested mountains, rural valleys and important waterways. The Committee aims to provide Yarra Ranges Council with informed and constructive advice, input and support. This will help guide the Council on environment and sustainability issues relevant to how we manage our natural environment. The Council is looking for a diverse committee. You might have interest, skills, experience or background relevant to any aspect of environmental stewardship including but not limited to; water management, biodiversity conservation, energy and climate change, sustainable development, land use and environmental planning. 5pm – Networking & Light Snacks. Optional tour of Margaret Lewis Reserve with Council Staff and Friends Group. Please RSVP by registering via www.yarraranges.vic.gov.au/Forum2018 by 14th November. The BirdLife Australia Aussie Backyard Bird Count begins today. This project utilises the capability of citizen science to gather observational data and extend knowledge about bird populations in Australia. For more information click here. The Draft Victorian Deer Management Strategy has been developed by the Department of Environment, Land, Water and Planning (DELWP) and the Department of Economic Development, Jobs, Transport and Resources (DEDJTR). You will find a copy of the draft Victorian Deer Management Strategy on the Engage Victoria website where you will also find a survey for public feedback. Submissions close 29 October 2018. The closing date for submissions is 2 November 2018. See here for submission information. 11:30am for a 12:00 lunch. February 2019 marks the tenth anniversary of the 2009 Victorian Bushfires. The Victorian Government has recently announced a Grant Program in support of community groups wishing to undertake commemorative or community strengthening activities for the 10 year anniversary. Funding for commemorative activities will be available to communities and councils across Victoria. For further details see the 2009 Bushfires Commemoration and Community Development Grants Scheme Funding Guidelines (1.73 MB). The Department of Environment, Land, Water and Planning have announced a new round of Biodiversity Response Planning Projects for the Port Phillip and Westernport area. The Yarra Ranges Council have been granted funding of $449,000 for the Birds to Butterfields Project which will undertake on-ground works to improve habitat for the critically endangered Helmeted Honeyeaters and connectivity in the surrounding landscape. Works will include fencing remnant vegetation, weed and deer control to bolster conservation efforts in a tenure blind approach. Biodiversity Response Planning is a new area-based planning approach to biodiversity conservation in Victoria. It is designed to strengthen alignment, collaboration and participation between government agencies, Traditional Owners, non-government agencies (NGOs) and the community. For more information click here. Parks Victoria, the Department of Environment, Land, Water and Planning (DELWP), and the Haining Farm Implementation Working Group are inviting the community to attend a drop-in information session to provide input into future improvements planned for Haining Farm. For more information click here or go to the Engage Victoria webpage. For the latest developments at Haining Farm view the August community update or go the the Engage Victoria webpage. Provide feedback on the Yellingbo Conservation Area Draft 10-year Plan 2018 by filling in the survey on the Engage Victoria website. Survey closes on 7 October 2018. For information about Community Consultation sessions click here or go to the Engage Victoria webpage. 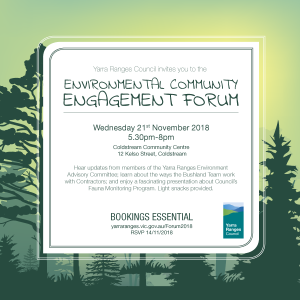 Save this date: To hear environmental updates for the Yarra Ranges Council , followed by a bus trip to Butterfield Reserve & Margaret Lewis Reserve. The talks & tours will be led by Council staff & environmental volunteers. Invitation and details to follow shortly. Yarra Ranges Council is hosting a sustainability event on the evening of Friday 14th September at Box Hill Institute, Lilydale Lakeside Campus. The key note speaker will be David Holmgren, one of the co-originators of the permaculture concept, and author of many books including his latest, RetroSurburbia: the downshifters guide to a resilient future. This is a fantastic opportunity to hear David, one of Australia’s most engaging and visionary environmental thinkers, who will present his empowering vision for the future of Australian suburbs. Please forward this email to your membership so that members can save this date in their calendars now. Macclesfield Landcare Group is hosting a workshop on Farm Biosecurity. A must attend for all property owners with livestock. Visit the Yarra Ranges Landcare Network website for more information. Minister for Energy, Environment and Climate Change Lily D’Ambrosio last week​ introduced the Flora and Fauna Guarantee Amendment Bill 2018 into Parliament. The result of three years work, the Bill will modernise and strengthen the existing Act, which has been in place for nearly 30 years and no longer reflects current conservation knowledge and approaches to regulation. The Bill will reform the Flora and Fauna Guarantee Act 1988 to give Victoria an up-to-date framework for biodiversity protection and management in Victoria, and strong protection for Victoria’s native species and important habitats. It provides for a modern regulatory approach, an increased emphasis on prevention and restoring the conservation status of threatened species, state-wide targets for Biodiversity 2037 and increased penalties for offences. Key stakeholders, portfolio agencies, local government, industry, environmental non-government organisations, Traditional Owners and members of the public have been consulted, and provided valuable insight to the review and subsequent Bill. Bronwyn is employed by Agriculture Victoria and is a Regional Coordinator for the Queensland Fruit Fly Action Plan 2015-2020. Bronwyn is working in the Yarra Valley with a range of stakeholders including: DEDJTR; DELWP; Agribusiness Yarra Valley; Melbourne Water; Parks Victoria; Yarra Ranges Council; private land owners; and community groups—to implement the Action Plan. The Yarra Valley strawberry, cherry and raspberry and blackberry growers, together with Hort Innovation, Agribusiness Yarra Valley and Agriculture Victoria developed a Pest Free Place of Production (PFPP) program in the Yarra Valley. The PFPP program enables participating growers to take extra management precautions and certify produce as pest free for interstate trade, and not need to perform QFF post-harvest treatments that can deteriorate fruit quality and shelf life. Certified surveillance traps and rigorous fruit inspections are in place to ensure that the fruit is free of QFF. Bronwyn provided an overview of an emerging problem with Queensland Fruit Fly infestations in some areas of the Yarra Valley and provided information about the Yarra Valley Fruit Fly Action Plan. Bronwyn highlighted the importance of monitoring and prevention strategies to keep the Yarra Valley QFF free. There was extensive discussion about other possible vectors for QQF including fruit trees and other vegetation on private land; blackberry infestations (possible host plant) on public and private land; and various vegetation occurring on roadside verges which are the responsibility of Local Councils and VicRoads. It was noted that control and prevention mechanisms require an integrated approach involving all land owners and land managers. YCACC assistance was requested and it was suggested that this issue should be addressed in the YCA Plan. There is $2 million available for Biodiversity On-ground Action through the 2018 Community and Volunteer Action Grants. Grants between $5,000 and $50,000 are available for single and multi-year projects.The grants support a wide range of on-ground activities to help protect, improve and expand habitats for our native plants and animals. Funding also supports activities that help communities better understand and manage local native species and natural environments. Projects include monitoring of wildlife and native plants, enhancing and protecting habitats for a range of threatened species, planting of indigenous vegetation, reducing weeds, making and installing nest boxes and engaging and educating local communities about improving biodiversity. To find out more information about Community and Volunteer Action Grants visit the Victoria Government website. The Victorian Government has announced $25.66 million to support biodiversity and threatened species through community action grants, support programs and regional partnership approaches. The funding will focus on protecting and managing a range of native plants and animals, threatened species and habitats through increased engagement and alignment of natural resources, scientific, educational and community sectors. A newly constituted Working Group for the Haining Farm Redevelopment Project is moving forward with design and works planning at Haining Farm as the implementation stage begins. Haining Farm will see increased community access for recreation and education; and will provide habitat for the critically endangered Helmeted Honeyeater and Lowland Leadbeater’s Possum. See the Engage Victoria website for more details. Landcare for Singles – Something Different! TheYarra Ranges Landcare Network (YRLN) conceived the idea for an event combining the opportunity for singles to meet whilst doing something worthwhile for the environment. Since its inaugural event in 2011, the Network, collaborating with land managers and volunteers, has rolled out another 9 “like” events including “Landcare for Single Parents” and “Landcare for Cyclists”. 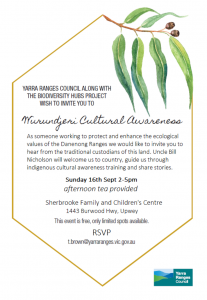 Yarra Ranges Council has supported 6 of these events and the remainder have been hosted and supported by individual landcare and friend’s groups. The L4S events have attracted great interest and attendance, achieved good onground environmental outcomes and are something the Yarra Ranges Landcare Network feel very proud of! The event has been supported nationally by Landcare Australia, with events being rolled out across Australia. Would you like to get involved? Visit the Yarra Ranges Landcare Network website.